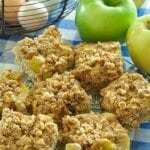 Apple Spiced Baked Oatmeal | JPMA, Inc.
Preheat oven to 375 degrees. Lightly oil or spray an 8" x 8" baking pan. Combine the egg, applesauce, milk, vanilla and oil in a bowl. Add the apple. In a separate bowl, mix the rolled oats, baking powder, salt and cinnamon. Add to the liquid ingredients and mix well. Pour mixture into baking dish, and bake for 25 minutes. Remove from oven and sprinkle with brown sugar and nuts. Return to oven and broil for 3 to 4 minutes until top is browned and the sugar bubbles. Serve warm. Refrigerate leftovers within 2 hours.